‘This month I’m celebrating 10 years of working at Fortnum’s. 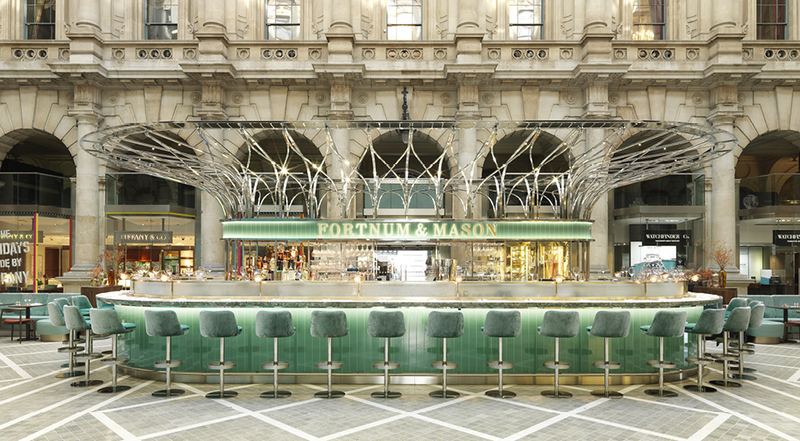 I worked at two of the restaurants in Fortnum’s flagship store in Piccadilly – I was the executive sous chef for three years – and then last year I came to The Royal Exchange. I’m so proud to be here, bringing a bit of Fortnum’s fun and quirkiness to the City. It’s such a beautiful building. The courtyard is so grand and opulent, I just love it. You can come and have a quick breakfast in the morning, and then you could have a long business lunch or a leisurely afternoon tea, all the way through to your after-work cocktail. It’s very interesting to see how the dynamic changes with the time of the day. There’s a wonderful atmosphere, especially when it’s busy, the evenings and dinner service are brilliant. There’s a team of 10 of us in the kitchen, up on the mezzanine, we all get on so well. I believe a happy team creates happy food and provides good service, it’s so important. The quality of our produce and service is what really excites and drives us. Whatever we do, we strive to do it well. Even if it’s something basic, we want to do it brilliantly – if we are making a cup of tea, we’ll make the perfect cup of tea. If it’s making a scone, we want to make it the best scone. Fortnum’s has been around for 312 years, sourcing and importing exotic ingredients from all over the globe. On my menu, for example, I’ve got some really wonderful things, like finger limes – it’s a bit like lime caviar – and I serve that with scallops from Australia. Most of our products, though, are sourced from small, local UK producers and suppliers who are really the masters of their craft. I’m very proud of my fish, I buy it from Brixham market in Devon – they ring me up at 11 o’clock each morning to tell me what’s landed that day. And then it arrives and gets cooked the very next day, so it’s wonderful and fresh. Our fish of the day special is very popular. 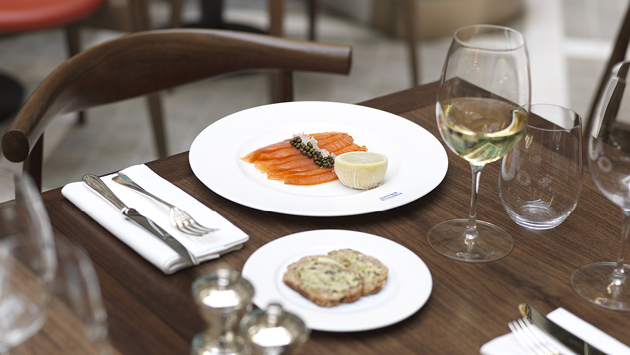 Our consistency keeps our customers coming back to us, so sourcing excellent ingredients is key, such as our classic smoked salmon, which we cure and smoke ourselves at Piccadilly and carve at the counter at The Royal Exchange. It’s so good, we don’t need to do much more to it – we just serve it with a few capers, a few shallots and our own soda bread and seaweed butter. It’s so simple, but it’s also lovely because it’s done really well. I get my cheeses from down the road, and I get whatever is good at the time, so the menu changes regularly. If I ask for a certain cheese and it’s not at its best ripeness yet, the cheesemonger will advise me to wait a few more weeks, and serve another cheese in the meantime, so we evolve our menus with the season. I’ve got some Sicilian tomatoes on my menu at the moment – they’re a bit small and they’ve got a slightly tough skin, but they’re full of flavour. I cut them very thinly and then marinate them well with a dressing of good olive oil, salt and lemon juice and it’s a lovely thing to have in the winter, served with burrata. We also have a delicious heritage beetroot salad with pickled walnut and watercress. Our menu features a lot of classic dishes that people love and associate with Fortnum’s such as the Scotch egg, which we invented in 1738, and Oeufs Drumkilbo – a lobster cocktail with chopped egg and tomato – which was a favourite of the Queen Mother. Then there’s Welsh rarebit, fish pie and our very exclusive Glenarm beef from Northern Ireland. But we’ve also got some more innovative dishes, which gives us the flexibility to do vegan or gluten-free and dairy free dishes as well, because obviously we have to evolve with the times too. We make a lovely vegan curry, with butternut squash and Jerusalem artichoke, while a tasty Matcha pancake with coconut yoghurt is on the breakfast menu. We have a special ‘grill’ section on The Royal Exchange menu, which features dishes we cook in our Josper charcoal oven. It really enhances the flavour of whatever you put in it. This can be meat or fish, but it also works really well with vegetables to lock in the flavour and the juices – the grilled aubergine is very popular. The Fortnum’s Bar and Restaurant is open every Monday to Saturday, welcoming guests from breakfast through to dinner. 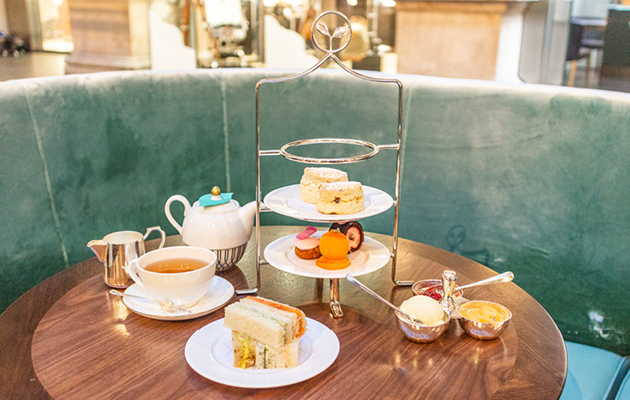 There’s also afternoon tea, as well as bar snacks and an extensive drinks menu featuring fine wines, champagnes, spirits, cocktails, teas, coffees and hot chocolates.